Disney’s Prince Charming movie has found a director. Daisy Ridley talks the challenges of facing Snoke for Star Wars: The Last Jedi. Fear the Walking Dead adds another regular. Plus, when to expect the return of The X-Files, new Legends of Tomorrow footage, and a first look at Mon-El’s return and Saturn Girl’s debut on Supergirl. Spoilers, away! 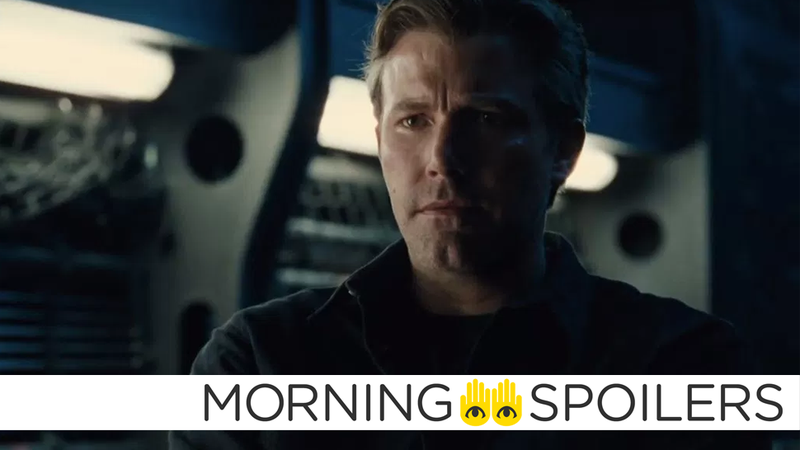 According to reporter John Campea, Matt Reeves has an actor in mind to replace “Batfleck” should the actor find that “graceful and cool way to segue out of” his time in the role. I’m hesitant to say anything, but I talked to a Hollywood producer yesterday who told me who Matt Reeves wants as Batman. And, I’ll be honest with you, the name they [gave] me caught me a little bit by surprise. I called somebody else later in the day, saying, ‘Hey, I heard this, is there any validity to this?’ And they said, ‘Well, Matt does want him.’ But, that doesn’t mean it’s going to happen. There’s been no movement or anything like that. It doesn’t mean anything’s going to happen. THR reports Stephen Chbosky (Wonder) has been hired to write and direct Disney’s spinoff focusing on Cinderella’s unnamed love interest, “Prince Charming”. Screen Rant has the film’s first poster of Dwayne Johnson posing with George, the albino gorilla. In further Rock news, Coming Soon has character posters of Jumanji’s four main character avatars. Head to the link to see some more. In addition to her love of Porgs, Daisy Ridley spoke to USA Today about the scene in which Rey is tortured by Snoke. It was painful. My throat hurt after that one… Snoke is one of those tests for Rey. And when I say testing, it’s the worst use of testing ever. He looks mental. Snoke is an evil guy, if you can call him a guy. Meanwhile, Dolby Cinema is the latest theater chain to get its own, exclusive poster. The X-Files returns January 3rd, according to a poster released by Fox (courtesy of TV Line). Meanwhile, TV Line has this pulp-inspired poster for The Librarians fourth season. Spike has released a trailer for next week’s two-part season finale. Finally, the Legends meet up with Gorilla Grodd during the Vietnam War, because of course they do.